Update: I’ve now got a vegan version of this recipe here. Lavender is a scent I’ve loved since I can remember but has now become a taste I very much enjoy too, especially when paired with chocolate. It’s such a calming flavour and although quite subtle, it’s noticeable, even in a recipe with rich and bitter dark chocolate. The two opposites create a delicate harmony, making them an ideal pairing. I first tried tasting lavender when creating my Lavender & Blueberry Porridge and whilst I could see why it may not be to everyone’s taste, I loved the purfume-y earthiness, it has such a decadent feel to it. But it’s definitely best tried with chocolate and that is why I made these cupcakes! Preheat your oven to 180c and line a cupcake tin with cupcake liners. In a heat-proof bowl, stir the butter and chocolate over a pan of simmering water until melted. Take off the heat and whisk in the sugar and eggs. Mix until smooth and glossy. Sift in the cocoa powder and whisk again until a thick batter is formed. Spoon the mixture into the cupcake cases about 2/3 of the way full. Bake for 15-20 minutes until the tops of the cupcakes are spongey but firm. Leave to cool for at least 30 minutes before icing. 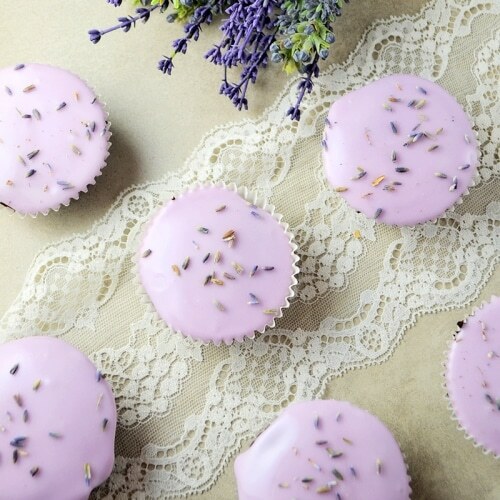 To make the icing, pour the milk into a pan with the dried lavender and bring to a boil. Remove from the heat and let it infuse and cool for 10 minutes. Strain the milk and discard the leftover lavender. Pour into a large bowl and whisk the icing sugar in. Add the food coloring until desired colour is achieved. 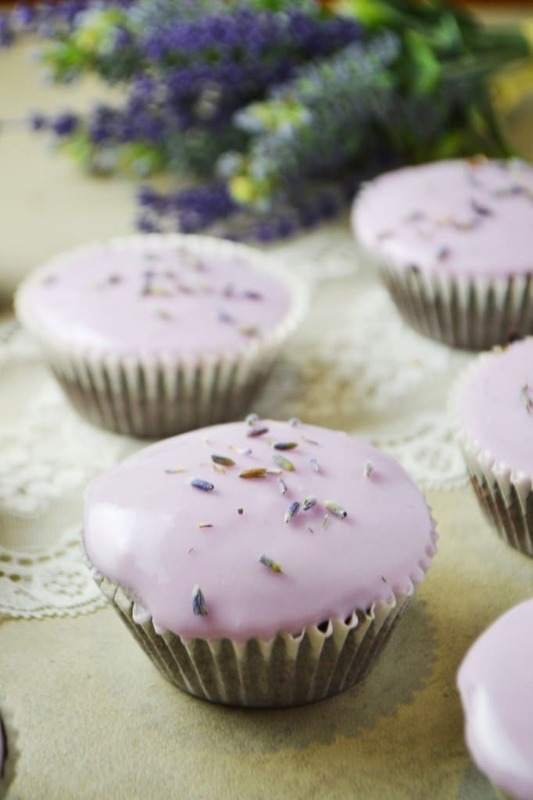 Ice the cupcakes and add some extra dried lavender on top for decoration, if you wish. Leave in the fridge for 15 minutes to let the icing firm up. Enjoy! These cupcakes are delicious, rich and also flourless which means they are suitable for celiacs! (assuming you use gluten-free chocolate and cocoa.) Are you planning on baking to celebrate cupcake week? 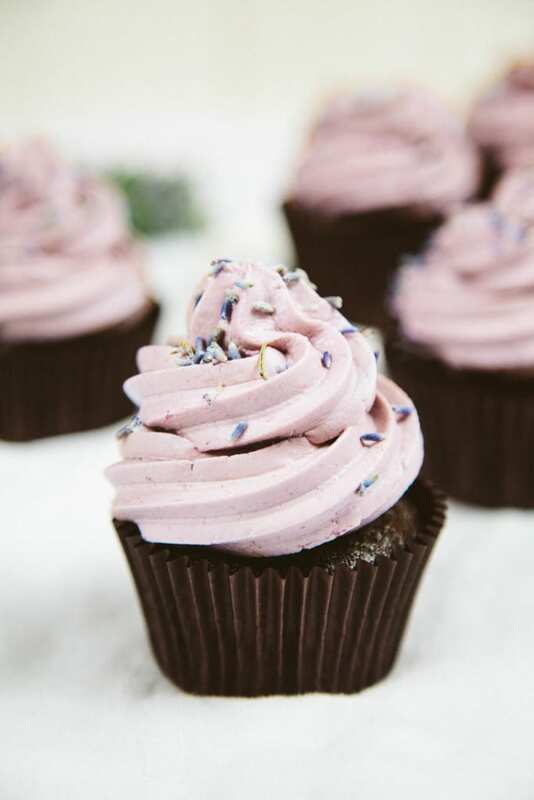 Check out my gluten-free & vegan Chocolate Lavender Cupcakes here! Instead of infusing the milk for the icing with lavender, could I use the butter in it instead like in the vegan ones? Do they taste differently depending on what you do? Hi Sarah Yes, the milk & icing sugar frosting is quite thin and very sweet. You can use the buttercream frosting recipe from my vegan post instead which gives a creamier texture and not quite as sweet taste. Yum, these look delicious! I will certainly make them. Oh dear. You are so right, apologies for the mistake! I get my US measurements via google or measurement sites but I'm starting to feel really uneasy doing that... So from now on, I'm going to measure with cups as well as grams at home. Thanks for pointing this out though, I've changed it to 1 cup instead. Thank you :-) Glad you think so! Thank you Helen, they would make a lovely addition to fancy afternoon teas! I love lavender and these are so lovely. Does this recipe make one dozen? Thanks!! That's exactly what I needed to know. I can't wait to try these! This may be a dumb question, but what is "caster sugar"? Is the same as regular white sugar? I want to try these cupcakes! Thank you so much :-) I can't remember where I first saw them paired together, but I could just imagine it being delicious and it was! Got to get my hands on some dried lavender, these look great! These look yum. I love the colour! I recently bought some dried lavender for cooking when I was in Greece and was wondering what to do with it. Hadn't though of pairing with chocolate, but sounds completely right to me! The flavours really do compliment eachother, I hope you'll love it! 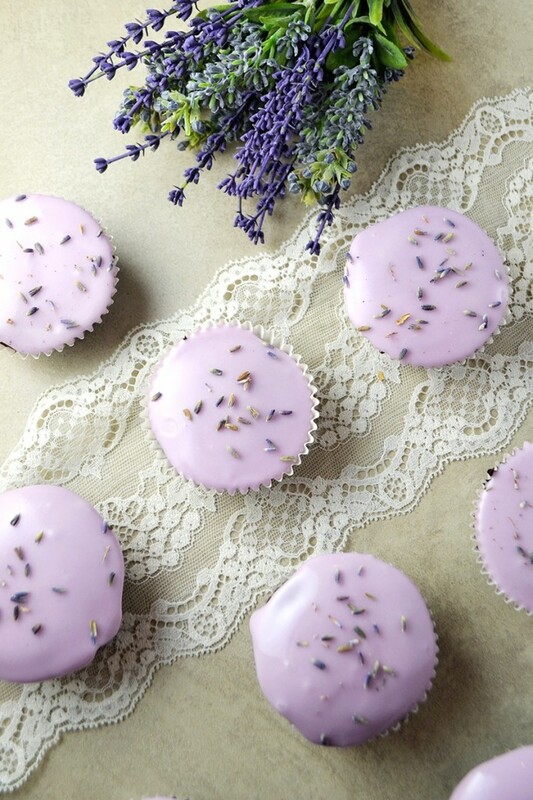 What a beautiful photo with the lavender! Your post makes me think of and smell like lavender! Gorgeous gorgeous! Thanks Rika :-) Can't get enough of lavender!